Why use standoff caps in businesses and homes? These round screw covers are used to cover up unattractive mounting hardware or may even be employed as the hanging fasteners themselves. Standoff cap systems directly attach signage to walls by sandwiching the signage against the hanging surface. The metal screw covers are used with threaded washers in order to cover up ugly hardware and make it more pleasing to viewers. 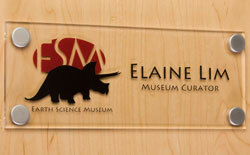 The assembly of the sign mounts is easy and takes only minutes to complete. 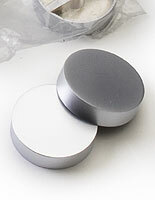 The standoff caps, like screw covers, are available in a few finishes: chrome, satin silver, and brushed silver. The mounting hardware is able to bring a bit of elegance to any setting without a high price point. 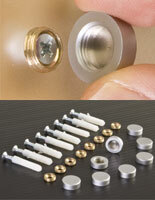 What are the most common uses for screw covers? 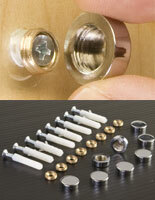 What are the most common uses for screw covers? These standoff caps are often seen covering up ugly hardware heads. To be blunt, this is the most common use for these economical little display accents. A beautifully printed custom sign or panel mounted on a wall can be cheapened in the eyes of customers by how it's attached to the mounting surface. However, not every sign needs a specialized mounting system. 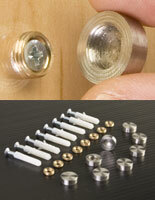 Decorative screw caps eliminate the need for custom display mounts or supports. The standoff coverings are also elegant decorations. These tops can be used as accents, edging, or even messaging elements to create a visually arresting look in a business or home. Shelving, artwork, and furniture can all be accented using these versatile cover assemblies. These tops are ornamental support. 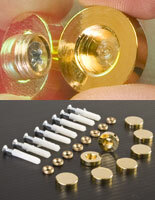 Edging and framing styles often need extra support for different pieces, which can be turned into decorative accents using these round screw caps. A strip of nails or screw heads supporting a shelf looks terrible in many cases; a line of attractive silver, chrome or brass accents turns the same supports into an ornamental accent that will coordinate with other décor elements. Visual display is important in both business, institutional and personal environments. For a company, a professional and polished look is important and goes a long way toward presenting an image of professionalism and creating an environment of trust for customers and clients. For a residence, home office, or other environment, a cohesive design or complementary decorative scheme can help create a soothing and restful space. Design elements range from the overall, such as color and decorating schemes, to small, detailed elements such as decorative accents and ornamental detail and placement. Businesses frequently spend significant amounts on design, for everything from logos, advertising and general branding to interior furniture and building design. When looking at design elements, it is important to understand how small elements can impact the big picture. How are standoff coverings used? 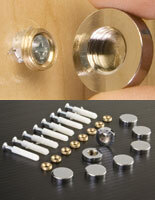 The assembly kits come with 8 decorative accent discs and all the hardware needed for mounting. 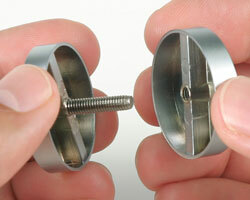 Standard screws (available in most common sizes) and anchors are supplemented by special threaded O-rings that serve as connectors between the heads of the screws and the cap covers. Installation merely requires a standard screwdriver! The same can pretty much be said for the knob sets. The smaller groups also come with 8 tops and different threaded rod sizes to accommodate different widths of mounted materials. These coverings are also sold in bulk amounts for better price points. 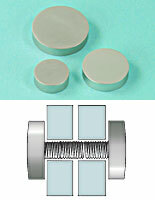 They are available in sets of 100 or 200, but do not include the threaded rods. These covers can be used almost anywhere a "standard" threaded connector would be used, but will add a decorative element. Several decorative finishes are available: satin silver, stainless steel, chrome, and gold. By matching the finish to the surrounding décor, a comprehensive visual appearance can be achieved to complement any decorating scheme. 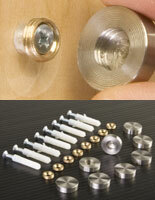 These standoff coverings are made of metal, namely brass or stainless steel and ae then plated with the desired finish. The construction of the covers is more durable than many similar plastic models, but they are sold at the low plastic prices. 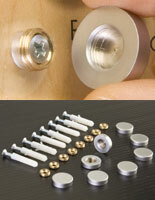 Do yourself a favor and purchase the metal sign mounting hardware kits. They will hold up better and last longer making them much more worth the money that you as a home owner or business owner will spend. !